Rack KVM Switches | Simply Connect Pte Ltd.
ATEN Rack KVM switches allow you to contol multiple servers from a single console – saving your cost, time, space and energy. They support multiplatform servers via optional custom cables. The CS1308 KVM switch allows access and control up to 64 computers from a single console (keyboard, mouse, and monitor). As many as 8 additional switches can be cascaded bringing the total number of connected computers to 64 computers that can be controlled from a single keyboard-monitor-mouse console. The CS1316 KVM switch allows access and control up to 256 computers from a single console (keyboard, mouse, and monitor). As many as 16 additional switches can be cascaded bringing the total number of connected computers to 256 computers that can be controlled from a single keyboard-monitor-mouse console. CS1754 is a KVM Switch with 4 ports and supports computers with PS/2 or USB interfaces via cables and audio signal function. Moreover, it supports 3-tier connection via cascade. With 21 sets of CS1754, users can control 64 computers. CS1758 is a KVM Switch with 8 ports and supports computers with PS/2 or USB interfaces via cables and audio signal function. Moreover, it supports 3-tier connection via cascade. With 73 sets of CS1758, users can control 512 computers. CS9134 is a KVM Switch with built-in PS/2. It can control 4 servers via a single console and allows users to switch between computers via the buttons on the front panel of the switch or the hotkey configuration on the console keyboard. It is the simplest and most convenient most convenient solution for multi-computer management. CS228 is a high-efficiency KVM switch which provides the most efficient solution. Its console with 2 built-in PS/2 allows users to control 8 servers either alone or by sharing. The built-in DB-25 of CS228 can reduce cable derangements in component rooms and can enhance signal quality and operation efficiency. 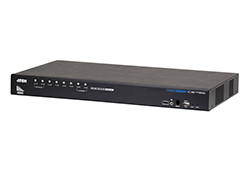 CS128A is a KVM Switch with 8 built-in ports. It can control 8 computers via the console. Moreover, it allows connections of up to 512 servers in 3 tiers by cascade for central control.